WHEN WORD leaked that Japan was planning to pull out of the International Whaling Commission (IWC) this year in order to kill whales at will, the reaction was swift and fierce. Australia said it was “extremely disappointed”. Others likened Japan to a rogue state. So much for its claims to uphold international institutions and act as model global citizen. The move, critics railed, was like America pulling out of the Paris agreement on climate change. Yet all is not what it seems. For a start, even as Japan leaves the IWC, it has forsworn whaling in the Southern Ocean (the waters surrounding Antarctica). 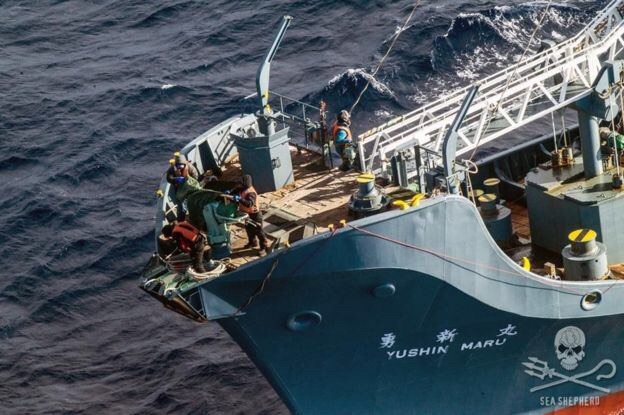 Nearly every austral summer since the IWC imposed a moratorium on commercial whaling in 1986, Japan has sent the Nisshin Maru and other vessels there to catch whales for “research” (after which the meat ends up in restaurants). The Sea Shepherd Conservation Society, in turn, tries to sabotage the hunt. Now, after two centuries of whaling on an industrial scale, the Southern Ocean will be a cetacean sanctuary. Sea Shepherd is claiming victory. Australia is likely to be relieved too. For it and New Zealand, it removes a thorn in the side of their relations with Japan at a time when the three countries are seeking ways to draw together in the face of a rising China. In truth, Japan could no longer afford to continue the Southern Ocean hunt, even if giving it up exposes the old lie of “research”. The venture is so bankrupt it has, in effect, been nationalised, propped up with hundreds of millions of dollars of subsidies. The ageing Nisshin Maru would cost a fortune to replace. 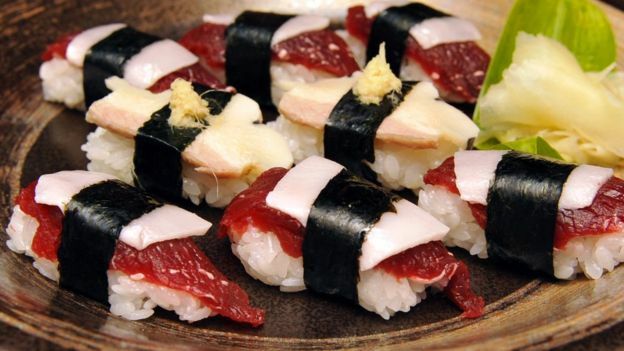 Meanwhile, although whale meat remains on Japanese menus and shop shelves, its consumption continues to plummet. Gristly, greasy whale sashimi no longer appeals, it seems. Much of it ends up in schools and nursing homes, where the clientele has little choice. There is still a tiny but influential lobby at home, however. A few towns have ancient traditions of whaling, something the IWC took little account of. It allows various indigenous groups around the world to hunt whales for “subsistence”. 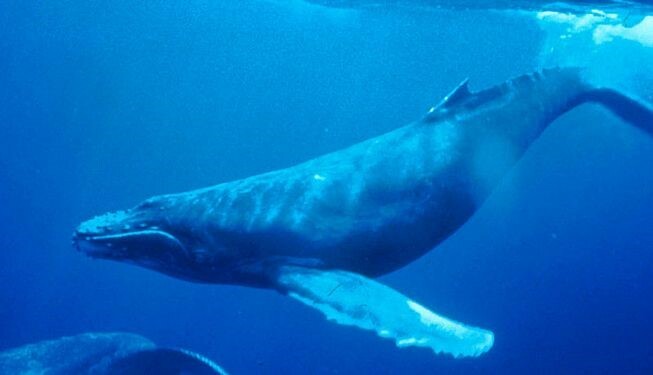 The people of the Caribbean island of Bequia may go after humpbacks, even though they learnt whaling only 150 years ago, from New Englanders. The Makah tribe of north-western America had not caught a whale in 70 years when it resumed whaling in 1999. In Taiji, on Japan’s main island, memories of whaling are more recent and the tradition many centuries old. People have family names like Tomi (“lookout”). Stone monuments along the coast appease the spirits of whales, whose meat sustained the town through famines. Yet there is no dispensation from the IWC. So the government plans to allow whaling in Japan’s huge territorial waters. A small local fleet has survived by hunting cetaceans not covered by the IWC, such as dolphins and Baird’s beaked whale, and by conducting “research” of its own. Freed from the commission’s constraints, it might increase its catch from 50 minke whales a year to 300. Japan had previously sought a similar arrangement within the IWC. A decade ago a compromise seemed within reach, before pressure from unyielding conservationists caused Australia to lose its nerve and drop its support for such a scheme. Whalers and conservationists have long talked past each other. The pity now, as Peter Bridgewater, a former IWC chairman, puts it, is that Japan is giving up catching minkes from a healthy population in the Southern Ocean in return for catching unmonitored numbers from a population in the north Pacific whose health is much less certain. But political considerations trumped all for Shinzo Abe, Japan’s prime minister. For conservatives in his Liberal Democratic Party, whaling is a nationalist emblem (while the Nisshin Maru hails from his own home port of Shimonoseki). The nationalists are already irked by Mr Abe’s plans to let more foreigners into the country, and by the growing realisation that only a disappointing compromise is possible with Vladimir Putin over northern islands controlled by Russia since the end of the second world war. Protecting plucky Japanese whalers is a useful sop. With whales now placed on the altar of expediency, will they be hunted mercilessly around Japan? Not necessarily. Whaling may be coming home, but its (mostly hidden) subsidies are surely dwindling. Besides, an informed debate about whaling’s merits in a country only vaguely aware of the industry may at last emerge. Let’s hear it now, please, from Japan’s whale-watchers. 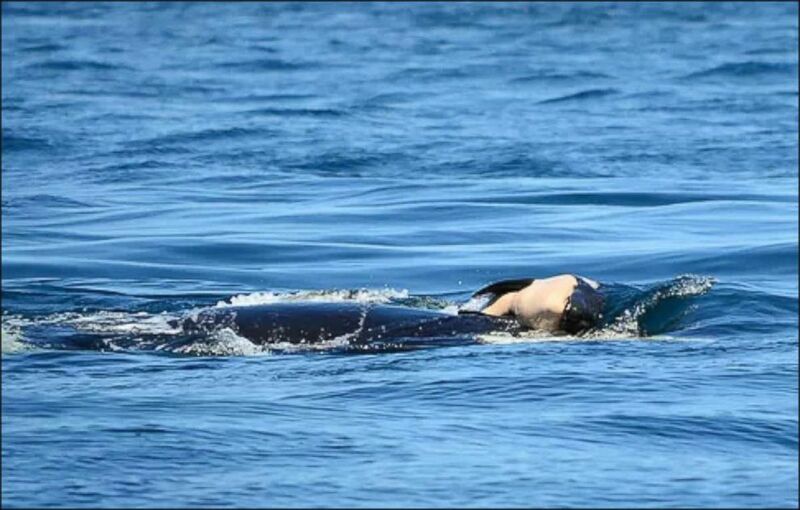 The orca whale who first made waves recently for carrying her dead calf for days after the calf died is apparently still doing it, according to a researcher. Taylor Shedd, a Soundwatch researcher who works to make sure that private boats follow state and federal law in order to protect whales, started his mission to find the whale at 2 p.m. on Tuesday. After five hours of searching, he spotted the J35 whale at British Columbia’s Southern Gulf Islands as the whale was traveling with her family around her. Shedd noted when they left around 8:30 p.m. she was still carrying her dead calf and was doing the same on Wednesday, for a ninth day, when they went back on the water. "J35 still carrying her dead calf for a ninth day," Shedd told ABC News. "The calf she is carrying is clearly decomposing and starting to lose its rigid form." 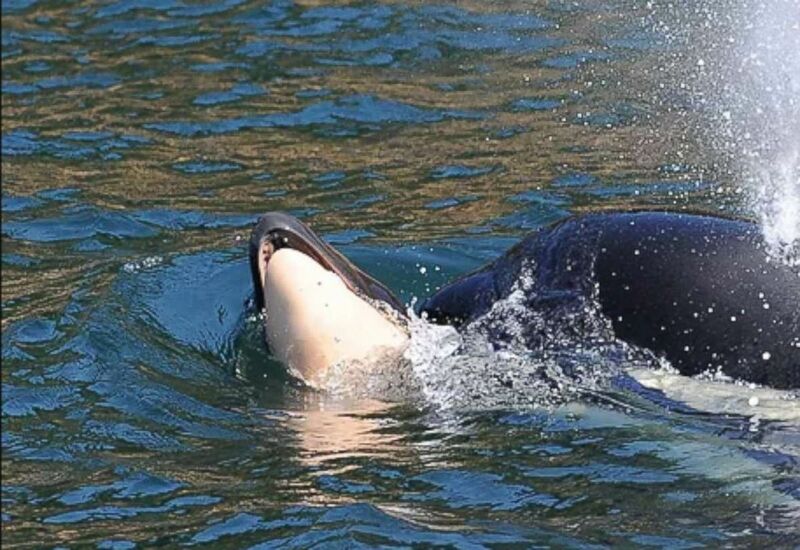 The calf, which survived for about half an hour, was the first offspring among 75 southern resident killer whales on the West Coast in three years, according to Ken Balcomb, founder of the Center for Whale Research. A shortage of food leaves females unable to deliver healthy offspring, Balcomb noted. 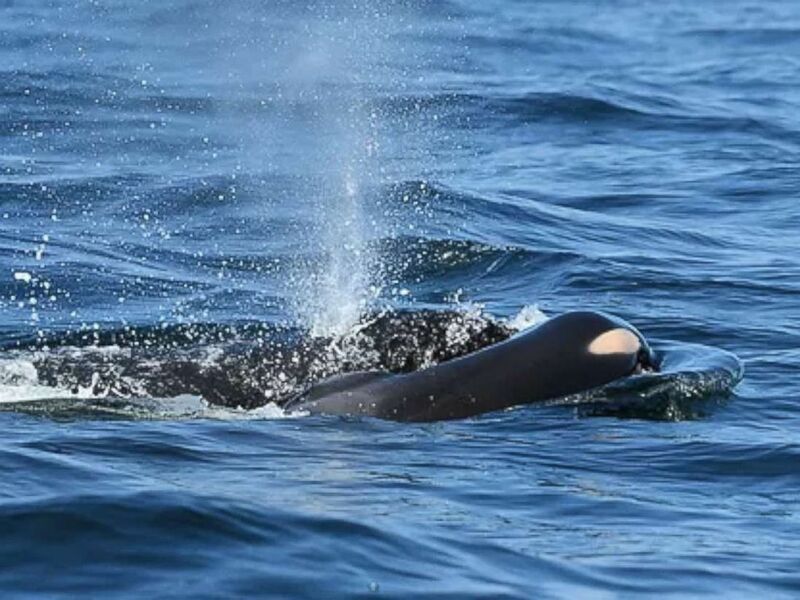 Balcomb told ABC News last week that he spotted the grieving whale, a 30-year-old J35, on the morning of July 24 in waters off the coast of Victoria, British Columbia. It’s been at least 200 miles that J35 has been swimming as of the evening of July 31, and she has gone back to where her calf was born sometimes pushing the calf with her nose, on top of her head and sometimes carrying it in her mouth, according to Shedd who's still following the whale. “She traveled around every single day for the past eight days,” Shedd said. Even though J35 is grieving and mourning her dead calf, the researchers said it’s a positive sign that the whale is still swimming which is a sign of good health. Researchers believe that whales grieve over their calves because they have a strong bond with their young. “We are going to keep following J35 as long as she’s carrying to just monitor her health, make sure that she’s OK,” Shedd said. Soundwatch is watching the whale from at least 200 yards to make sure that they are not adding more stress or risk to the grieving whale, according to Shedd. “The southern residence has carried stillborn and dead calf before, but not for this long that we know of,” Michael Weiss of the University of Exeter, who has been working with the Center for Whale Research, told ABC News. 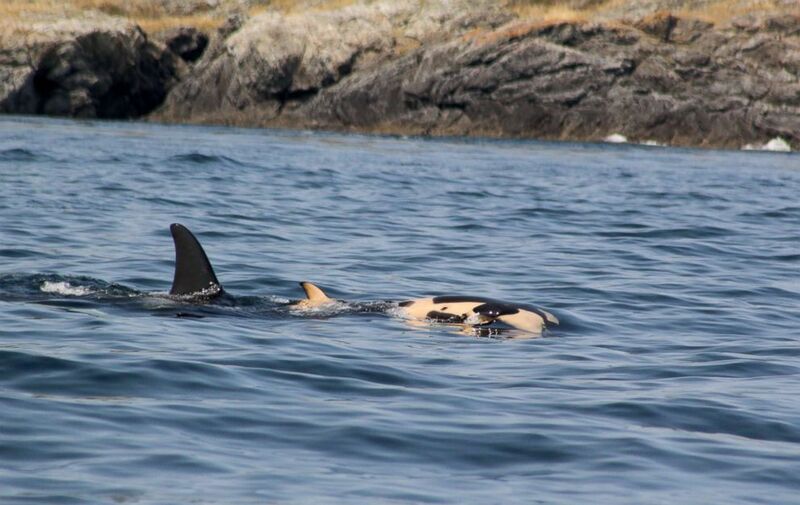 Weiss has already appealed the U.S. and the Canadian government to take serious and immediate action to protect killer whales. A dead blue whale calf has been found washed ashore in Japan - the first time that the rare species has been seen in the country, experts say. The carcass was discovered on Sunday at a beach in Kamakura, a city 70km (43 miles) south of Tokyo, on Japan's southern coast. 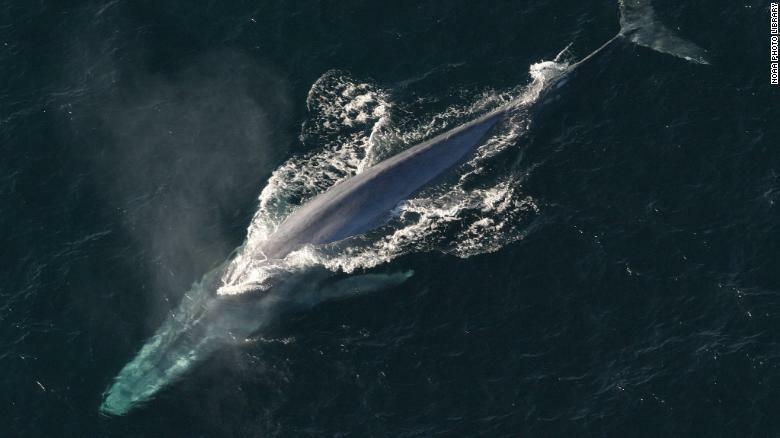 Blue whales are the largest of all animals. They can grow to 30m (98ft) in length and weigh up to 170 tons. The cause of the whale calf's death is not yet known. "The whale will be dissected by experts to find out more about how it got there"
Its remains are to be studied by experts and tents have been put up on the Kamakura beach to allow a dissection to take place. The male calf measured 10.52m and was born this year, an expert from the National Museum of Nature and Science told Japanese media. What is Japan's relationship with whales? Commercial whaling over many years brought blue whales close to the point of extinction. The World Wildlife Fund (WWF) says the animal is still endangered as a result of climate change and ship strikes. During the summer months, the mammals are often found near Antarctica. Japan still has a whaling fleet but insists its hunting programme is for scientific purposes. In May, Japanese hunters caught and killed 122 pregnant minke whales as part of its Antarctic summer "field survey". 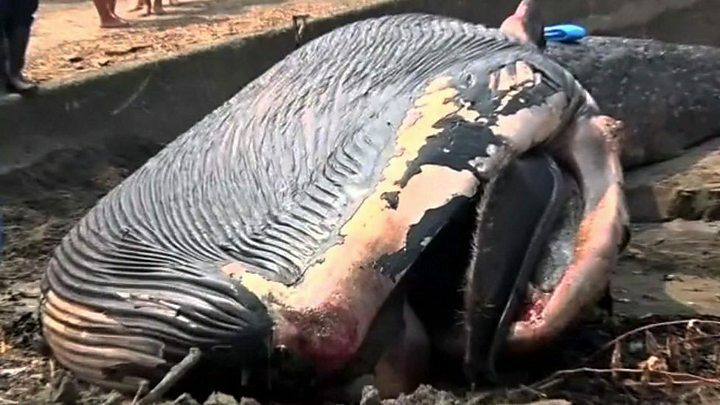 (CNN)One of Iceland's richest men has hit back against claims his whaling company illegally killed a protected blue whale. "We have never caught a blue whale in our waters since they were protected," Kristján Loftsson, managing director of Hvalur hf, told CNN. "We see them in the ocean. When you approach a blue whale, it's so distinct that you leave it alone." 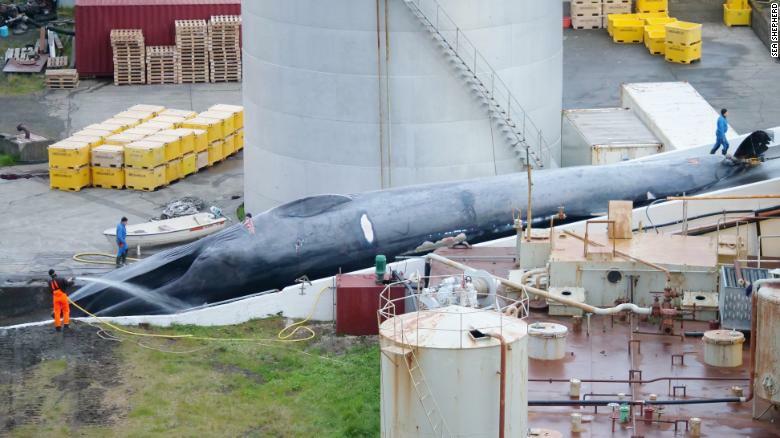 Anti-whaling group Sea Shepherd claimed Wednesday that Loftsson's company had killed and butchered a blue whale in Hvalfjordur, Iceland. Volunteers monitoring the whaling site photographed orange-clad crews examining the massive carcass. The largest animals in existence, blue whales are a protected species and have not been deliberately captured since 1978, according to the International Union for the Conservation of Nature. 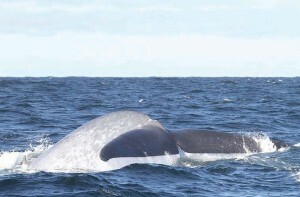 Loftsson claimed that the whale in question was either a fin whale, or a hybrid species, not protected under Icelandic law. He said if it was a blue whale the kill was purely accidental. 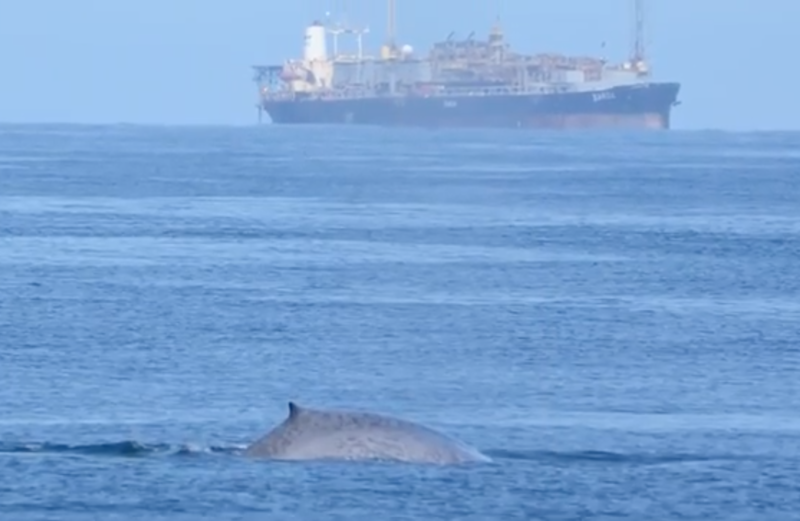 The difference between these and blue whales is "easy to see," Loftsson said. Conservationists disagreed however. Adam A. Pack, researcher and professor of biology at the University of Hawaii at Hilo, said the photos appeared to show a blue whale. "(Look at) the way the dorsal fin is hooked, the pointed pectoral fins, and the size of the animal," he said. 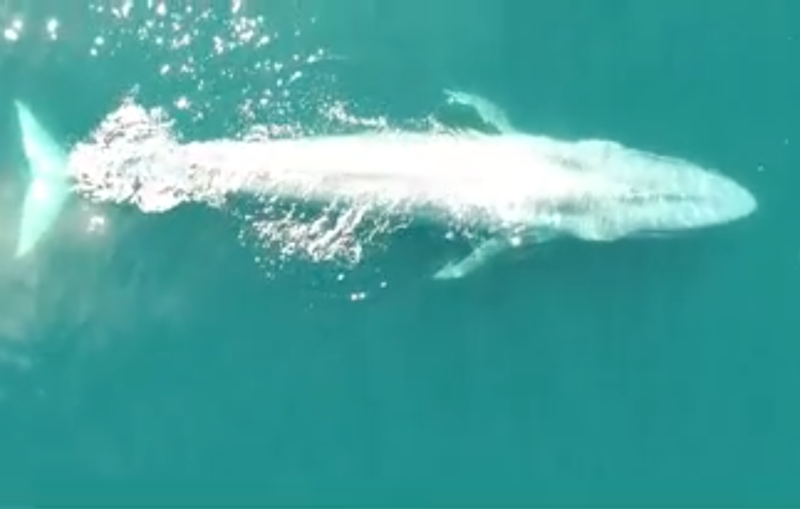 Pack also noted the lack of a white lip, characteristic in fin whales, and the mottling on the whale's flank, an identifier that acts like fingerprints, as more evidence the animal in question was likely a blue whale. 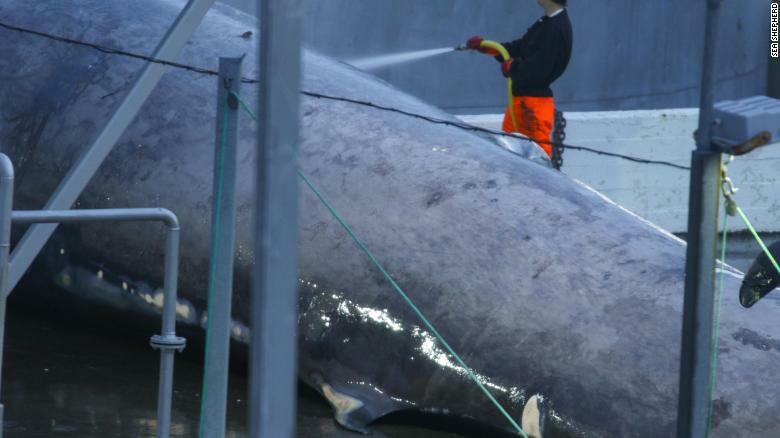 Authorities in Iceland will now conduct genetic testing to determine the whale's species, which may take months to complete. In a statement, the government said the "matter was (being) taken seriously by the government and the relevant authorities are investigating this issue." 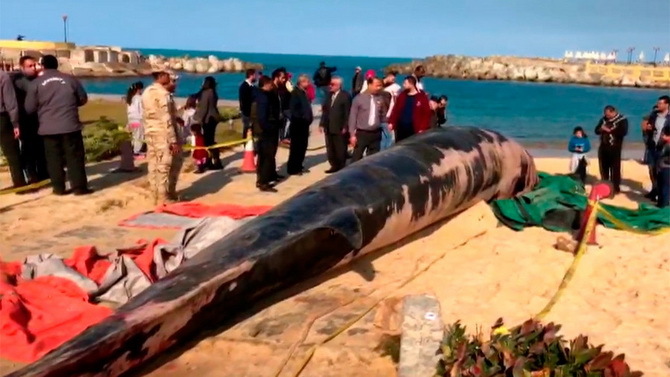 Initial information "suggests the animal caught is not likely to be a blue whale but rather a hybrid of a fin whale and a blue whale," it added. Hunted to near extinction Sea Shepherd's photos sparked instant outrage within the conservation community. While the fight against whaling is not a new one, this case has attracted greater attention and outrage due to the blue whale's rarity and protected status. Reaching 30 meters long and weighing up to 200 tonnes, blue whales have been protected worldwide by the International Whaling Commission since the 1960s, after decades of what Pack calls "unchecked exploitation." According to the World Wildlife Fund (WWF), blue whales were nearly wiped out by whaling fleets before regulations were created. A staggering 360,000 blue whales were killed in the 20th century in Antarctic waters alone, before the IWC effectively banned commercial whaling in 1986. Iceland regularly continues to hunt on its own terms, despite being a member of the IWC. The hunt of blue whales, however, is illegal. 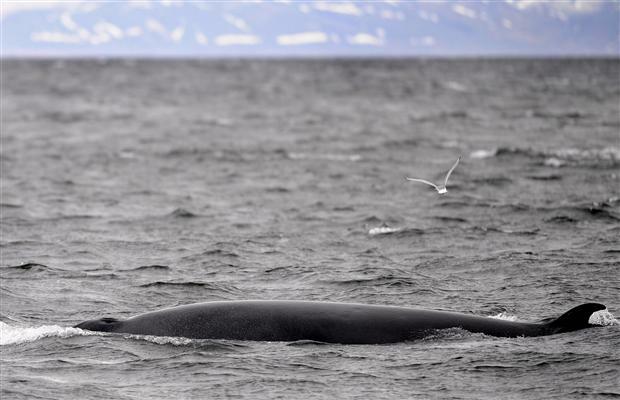 "It is important to note that blue whales are protected under Icelandic law with their capture prohibited," said Stefán Ásmundsson, Commissioner of Iceland to the IWC, in a statement. "Iceland has always emphasized the need for careful conservation of marine resources and was one of the first countries in the world to take a conservationist approach to whaling." An uncertain future Despite the intense criticism Loftsson has faced -- he has been dubbed a "rogue whaler" by some conservationist groups -- he claimed most Icelanders supported whaling. "We are a big fishing nation, we are a nation of the ocean," he said. "You have deer hunting in the US. It's the same." He claimed that sustainability was not an issue so long as whalers stick to regulations and quotas. "Why would we want to catch and catch and make it extinct? We would be cutting our economic soul," he added. Regulations may have staved off extinction, but blue whales are still a long way from recovery, with an estimated worldwide population of 10,000 to 25,000. Companies also continue to hunt other whale species. "The IWC is only as good as the nations who have subscribed to it," Pack said. "There are nations like Japan that hunt minke whales despite pressures from the US and other countries." Japan recently faced its own whaling controversy when an IWC report revealed that the country had killed 122 pregnant minke whales in the name of scientific research over a three month period. "From a research perspective, everything we need to learn about these whales can be taken from a non-lethal approach at this point," said Pack. "We're now in 2018. There is no reason to be hunting any cetaceans, including whales." The gigantic marine mammals are genetically distinct from whales found in the neighbouring Pacific and Antarctic Oceans, suggesting they are a separate group that lives permanently in the region. While they are not as large as their Antarctic cousins, the New Zealand population can still reach lengths of around 22 metres. On a 10-day research expedition conducted in 2014, Dr Torres and her colleagues identified 50 blue whales, but they needed to ascertain whether these individuals were migrating from nearby waters or a permanent fixture. Over the next three years the team conducted longer term studies in which they tried to establish the number of whales and how they were distributed around the region. The findings were published in the journal Endangered Species Research. “While we have gained a great amount of information about blue whales in New Zealand over the past few years, we continue to analyse our data and do more research to address other knowledge gaps,” Dr Torres said. In light of the planned industrial work in the region, Dr Torres and her colleagues intend to present their findings to political and industry leaders – including representatives from the whaling industry – this summer. The team is now “working closely with resource managers in New Zealand to help them understand what we do and don’t know about this New Zealand blue whale population so they can apply best management practices to minimise impacts from industry”. 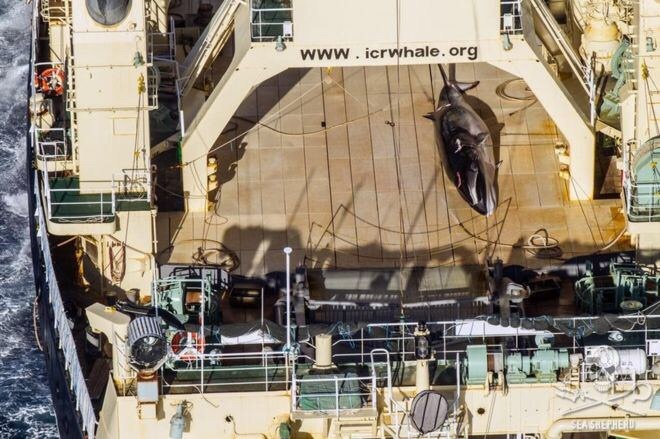 Australia has sharply criticised Japan after photos emerged allegedly showing it had resumed whaling off Antarctica. 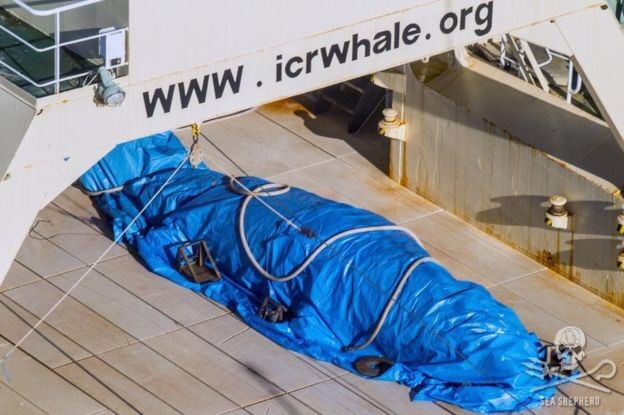 Anti-whaling group Sea Shepherd released the images, which it said showed a dead minke whale on a Japanese vessel on Sunday. It comes two days after Japan's Prime Minister Shinzo Abe arrived in Sydney to bolster defence ties with Australia. Australia's Environment Minister Josh Frydenberg said it was not necessary to kill whales for study. "The Australian Government is deeply disappointed that Japan has decided to return to the Southern Ocean this summer to undertake so-called 'scientific' whaling,'" he said on Monday. "Australia is opposed to all forms of commercial and so-called 'scientific' whaling." Japan's whaling has been ruled illegal by the Australian Federal Court. Why is Japan still whaling? A global moratorium on commercial whaling has been in place since 1985, with exemptions that allowed Japan to hunt some whales for "scientific research". But in 2014 the International Court of Justice (ICJ) ruled that Japan's scientific Antarctic whaling programme should cease. Tokyo suspended whaling for one season but announced it would soon begin another "scientific" whaling programme, drawing criticism from environmental groups and the Australian and UK governments. Japan insists it is trying to prove the whale population is large enough to justify a return to whaling for commercial purposes. It says it has to kill the mammals and study them in order to carry out its research. Australian Greens senator Nick McKim said the ICJ had the power to impose "fines or sanctions" on Japan. Latest claims Sea Shepherd said the photos showed the Japanese vessel Nisshin Maru inside the Australian Whale Sanctuary on Sunday. The boat's crew "scrambled" to cover the dead whale with a tarpaulin after spotting the anti-whaling group's helicopter, Sea Shepherd said. Two smaller boats, the Yushin Maru and Yushin Maru #2, also covered their harpoons, the group claimed. "The fact that the Japanese crew went to cover up their harpoons and the dead minke whale on deck just shows that they know what they're doing is wrong," said Wyanda Lublink, captain of Sea Shepherd ship the MY Steve Irwin. Sea Shepherd said it was the first minke slaughter to be documented since the ICJ ruling. Sea Shepherd has been patrolling the Southern Ocean for five weeks. Jeff Hansen, managing director of Sea Shepherd Australia, said the Australian government should do more to protect whales. Humans might not be the only creatures that care about the welfare of other animals. Scientists are beginning to recognize a pattern in humpback whale behavior around the world, a seemingly intentional effort to rescue animals that are being hunted by killer whales. Perhaps the most stunning aspect of this behavior is that it's not just a few isolated incidents. Humpback whale rescue teams have been witnessed foiling killer whale hunts from Antarctica to the North Pacific. It's as if humpback whales everywhere are saying to killer whales: pick on someone your own size! It seems to be a global effort; an inherent feature of humpback whale behavior. After witnessing one of these events himself back in 2009, Pitman was compelled to investigate further. He began collecting accounts of humpback whales interacting with orcas, and found nothing short of 115 documented interactions, reported by 54 different observers between 1951 and 2012. The details of this surprising survey can be found in the journal Marine Mammal Science. So the question is: Why are humpback whales doing this? Since the humpbacks seem to be risking their own well being to save animals of completely different species, it's hard to deny that this behavior seems altruistic. There is also some reason to believe that the behavior isn't entirely selfless. Mature humpback whales are too large and too formidable to be hunted by orcas themselves, but their calves are vulnerable. Orcas have been witnessed hunting humpback whale calves in much the same way that they hunt gray whale calves. So, by proactively foiling orca hunts, perhaps the humpbacks are hoping to make them think twice about messing with their own calves. Then again, maybe it's just as simple as revenge. Even if it has more to do with revenge than altruism, though, the behavior would represent evidence of an intense and complicated emotional life among humpbacks that is unprecedented in the animal world, outside of primates. One common feature among many humpback whale rescue efforts is that the humpbacks often work in pairs. Scientists will need to do more research into this behavior, though, to truly understand the significance of it. Until then, these beautiful animals, which are perhaps best known for their majestic songs, have certainly earned some additional respect. They might just be the ocean's most ferocious and selfless first-responders. ANCHORAGE, Alaska – Genetic tests confirm that a mysterious, unnamed species of beaked whale only rarely seen alive by Japanese fishermen roams the northern Pacific Ocean, according to research published this week. The testing shows the black whales, with bulbous heads and beaks like porpoises, are not dwarf varieties of more common Baird’s beaked whales, a slate-grey animal. 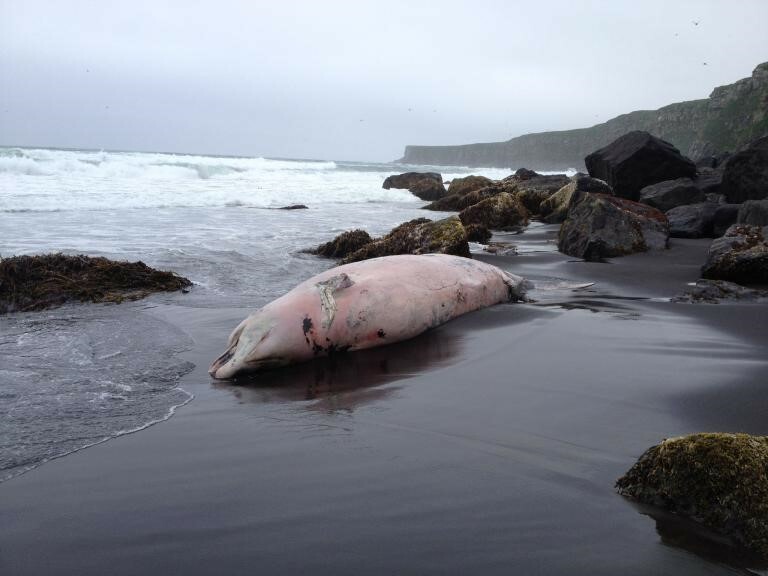 Japanese researchers sampled three black beaked whales that washed up on the north coast of Hokkaido, the country’s most northern island, and wrote about them in a 2013 paper. The challenge to confirm the existence of the new animal was finding enough specimens from a wider area for testing and matching genetic samples, said Phillip Morin, a National Oceanographic and Atmospheric Administration research molecular biologist. “Clearly this species is very rare and reminds us how much we have to learn about the ocean and even some of its largest inhabitants,” he said in an announcement. Japanese fishermen reported occasionally seeing a smaller, black beaked whale that they called “karasu,” the Japanese word for raven, or “kuru tsuchi,” black Baird’s beaked whale. The Japanese researchers in 2013 were limited in declaring that they had found a new species because their three samples were from one location, said Morin, who works at NOAA’s Southwest Fisheries Research Center in San Diego. “My first idea was to go to our collection, where we have the largest collection of cetacean samples in the world,” he said. The oldest was a skull in the Smithsonian Institution recovered from the Aleutians in 1948 and formerly thought to be a Baird’s beaked whale. Another specimen discovered in Alaska was in the collection of the Los Angeles County Museum of Natural History. “We knew it was not any whale we knew from our area,” Ridgway said in the announcement. Morin said scientists have more questions than answers about the new species, which is about two-thirds the size of a Baird’s beaked whale. “They’re hard to see, especially if the water is anything but perfectly calm,” he said, adding that acoustic research may help find them so they can be studied. Japanese researchers are in the formal process of “describing” the species, Morin said. That will include giving the whale a Latin and common name and formally defining its measurements and how it differs from other beaked whales. 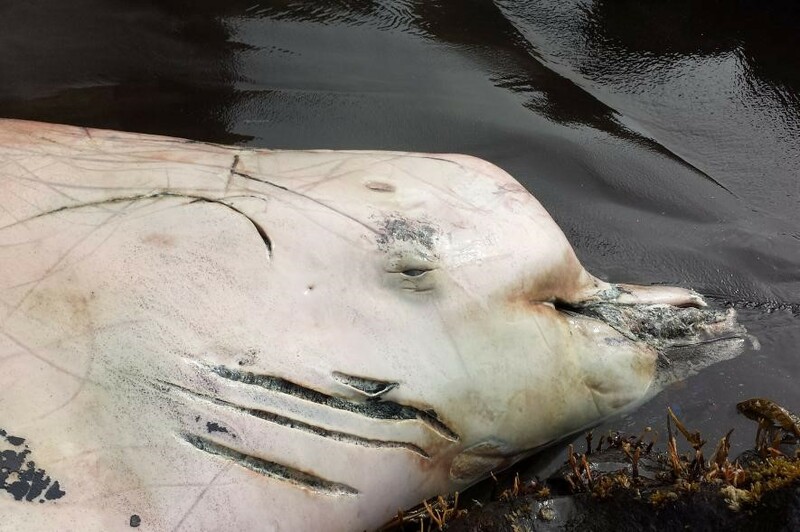 This whale washed up dead on Alaska's St. George Island in June 2014. Scientists say it is a newly discovered species of beaked whale. It turns out, according to new research published Tuesday, that this was not a Baird's beaked whale at all, but an entirely new species—a smaller, odd-shaped black cetacean that Japanese fishermen have long calledkarasu, or raven. It's just so exciting to think that in 2016 we're still discovering things in our world—even mammals that are more than 20 feet long. "It's a really big deal," says study co-author Paul Wade of NOAA'sNational Marine Mammal Laboratory. "If you think about it, on land, discovery of new species of large mammals is exceptionally rare. It just doesn't happen very often. It's quite remarkable." He is not alone in his enthusiasm. Robert Pitman serves on a taxonomy committee for the Society for Marine Mammalogy, which publishes an annual list of all recognized marine mammal species. He is not among the 16 co-authors on Morin's paper. But at a time when the diversity of marine mammals is shrinking—the Yangtze River dolphin is nowfunctionally extinct and Mexico’s vaquita porpoise is dangerously close—Pitman calls the discovery "heartening." More than 300 whales including 200 pregnant females have been slaughtered in Japan's latest whaling mission in the Southern Ocean. Japan confirmed the kill as its ships returned from their "scientific" expedition in the Antarctic region on Thursday. Its actions are in defiance of international criticism and despite a 2014 UN legal decision that ruled so-called scientific whaling activity in the Southern Ocean was a front for commercial hunts. VGreens senator Peter Whish-Wilson accused the federal government of turning its back on Japan's "sickening" illegal activity. "Not in 40 years has an Australian government done so little to prevent whaling on our watch and in our waters," he said. He accused the government of breaking Environment Minister Greg Hunt's personal election promise to send a patrol vessel to the Southern Ocean to monitor whaling activity. Malcolm Turnbull has promised to keep up pressure on Japan over whaling, while improving economic and defence ties. The government has repeatedly refused to confirm whether it undertook any monitoring missions in the Southern Ocean this summer. It has also refused to release legal advice it sought when Japan announced it would resume whaling, despite the International Court of Justice ruling. Four survey ships from Japan's Institute of Cetacean Research were in the Antarctic region over a period of 115 days from December 1 last year. The institute's report on Thursday confirmed 333 minke whales were captured. 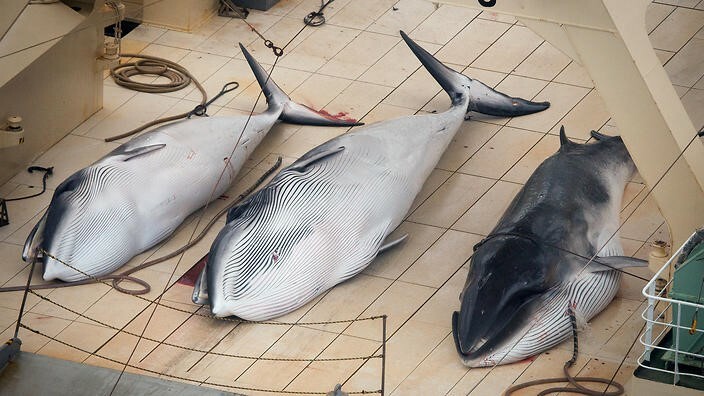 Darren Kindleysides, director of the Australian Marine Conservation Society, said the 2014/15 summer was the first time in 70 years Japan had stopped its whaling program - but the break was short-lived. He said Australia's leading international experts had examined Japan's new so-called scientific research program this year and found it was also a guise for killing whales, and a breach of international law. "That puts the onus on the Australian government to make sure this is the first and the last season of Japan's new so-called scientific program." The Australian government in December described Japan's decision to resume whaling over the summer as "deeply disappointing" and insisted it raised concerns at the highest level of the Japanese government. It had said it would consider sending a Customs patrol vessel to the Southern Ocean and explore options for legal action. But conservation group Sea Shepherd in February said the Japanese fleet had faced little or no scrutiny over the summer and Australia and New Zealand seemed unwilling to send a ship to intercept them. The 60 pilot whales stranded off New Zealand’s South Island have been refloated and “it’s looking quite good”, rescuers say. 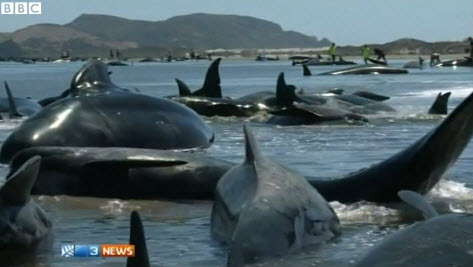 About 200 whales stranded on Farewell Spit in Golden Bay on Friday and about 140 died and the rest had been refloated. But 60 restranded and Department of Conservation (DOC) staff and 400 volunteers worked to keep them alive on Saturday until they could be refloated at high tide in the early evening. Lead whales were taken out on pontoons and other whales were moved to follow them, says DOC conservation services manager for Golden Bay, Andrew Lamason. “They’re all off and the lead whales are actually now swimming into deep water and are going in the right direction,” he said. “Our guys are moving in behind them to keep an eye on them and it’s looking quite good.” The whales were monitored overnight on Saturday. Farewell Spit is a narrow sand spit at the northern end of Golden Bay and there have been numerous previous whale standings there. 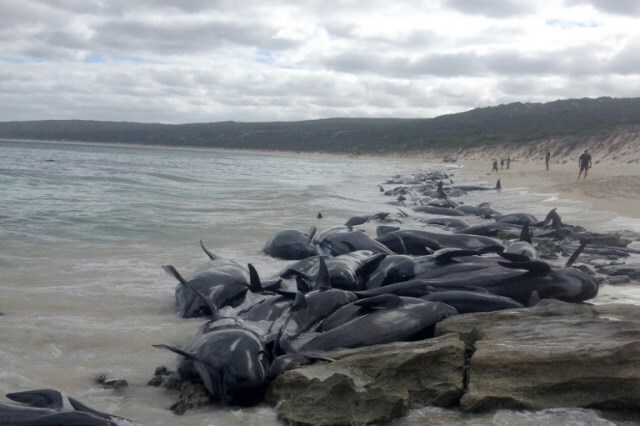 This is the biggest stranding in 15 years, according to locals. Pilot whales grow to about 20ft (6 metres) in length and are the most common species of whale found in New Zealand waters. 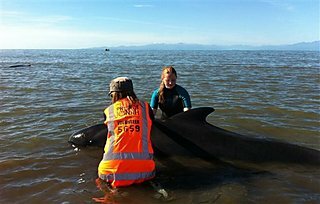 NEARLY 200 PILOT WHALES STRANDED IN NEW ZEALAND 13 February 2015 Last updated at 18:05 GMT Nearly 200 pilot whales have become stranded on New Zealand's South Island at a spot well-known for whale beachings. 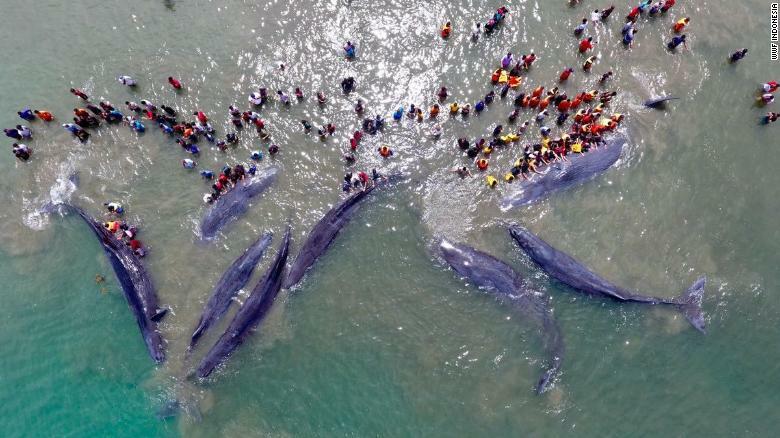 Dozens of conservation workers and volunteers rushed to the area and tried to refloat the whales as the tide rose. But at least two dozen of the 198 mammals died, despite efforts to save them, according to the Department of Conservation. Experts describe the area, called Farewell Spit, as a whale trap, due to the way its shallow waters seem to diminish whales' ability to navigate. 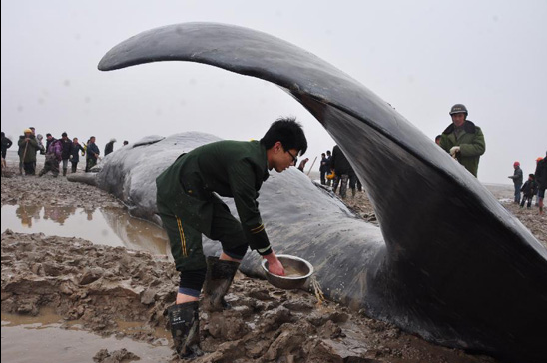 Frontier defense soldiers spray water to preserve moisture for a stranded sperm whale on the beach of Yancheng City, east China's Jiangsu Province, March 16, 2012. A mass-stranding of whales on a New Zealand beach has left 36 of the creatures dead and threatens 40 more. Department of Conservation area manager John Mason said 99 pilot whales stranded themselves Monday on Farewell Spit on the South Island. 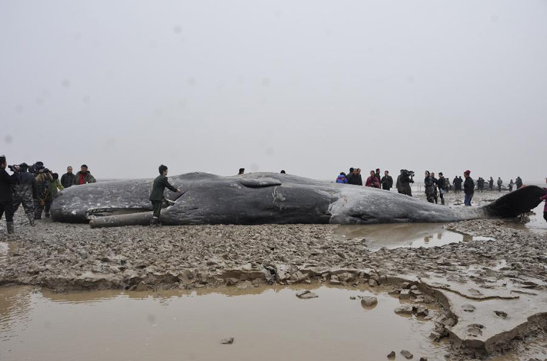 By Tuesday, 36 whales had died and another 40 remained stranded and were still in danger. Mason said conservation staff and volunteers had successfully refloated 17 whales, which had swum out to deeper water. Another six whales remained unaccounted for. 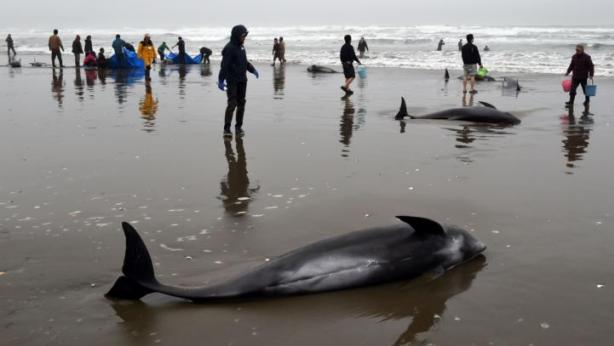 AP In this Tuesday, Jan. 24, 2012, photo... View Full Caption The 40 beached whales were briefly swimming in shallow water early Tuesday afternoon but became stranded again by the evening as the tide went out. Mason said volunteers would try to keep the whales cool and wet until dark. He said after that, all they could hope for was that the whales would swim away on the next high tide during the night. 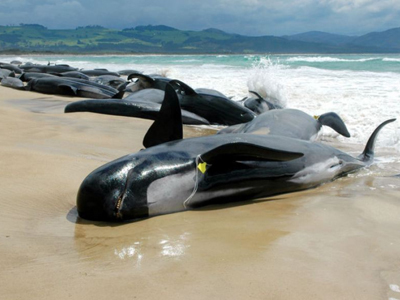 Pilot whales grow to about 20 feet (6 meters), and large strandings are common during the New Zealand summer. 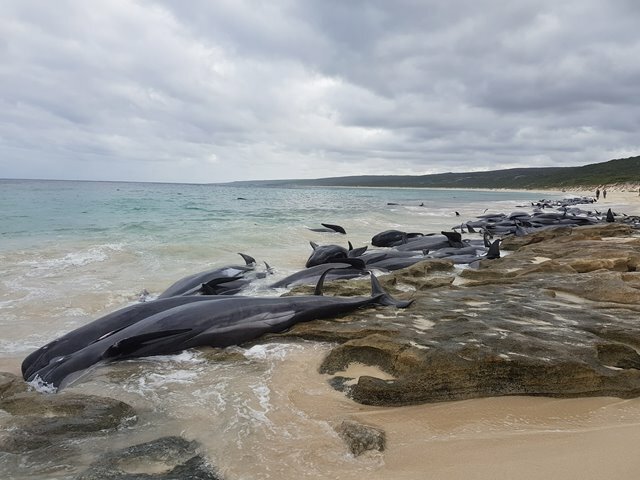 Experts describe Farewell Spit as a whale trap due to the way its shallow waters seem to confuse whales and diminish their ability to navigate. Southern California marine mammal enthusiasts should note that a special whale named Varvara will be passing through local waters today and Friday. The 8-year-old female gray whale, sporting a satellite tag that reveals her position, is special because she has swum all the way from Sakhalin Island in the western North Pacific off Russia, providing scientists with more evidence that Western Pacific gray whales may not be as distinct from Eastern Pacific gray whales as previously believed. Varvara hails from a critically endangered population of perhaps 130 Western Pacific gray whales, with very few breeding-age females. There are about 20,000 Eastern Pacific gray whales, famous for their annual 10,000-mile round-trip migration from the Bering and Beaufort seas to and from winter breeding areas in lagoons along the Baja California coastline. It has become increasingly evident that both populations utilize the same breeding areas. However, David Weller, a marine mammal specialist with the National Marine Fisheries Service, has authored a manuscript (under peer-review) which states that despite this mixing, "Significant DNA and nuclear genetic differences between whales utilizing the Sakhalin feeding ground and those summering in the Eastern North Pacific support the continued recognition of Sakhalin animals as a distinct genetic unit." Varvara is expected to pass through the Los Angeles/Long Beach area late today and pass Orange County and San Diego on Friday. Her odyssey follows that of Flex, who was fitted with a satellite tag a year earlier. Flex, a male Western Pacific gray whale, surprised scientists when he crossed from the western Pacific to this side, and joined with Eastern Pacific grays during their migration. The tag worn by Flex, however, stopped transmitting off southern Oregon. Varvara's tag is still relaying her position. She has been photographed with other gray whales off Oregon and Northern California, but it was not clear whether they were Western Pacific or Eastern Pacific grays. 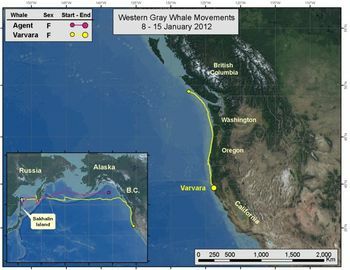 It's likely, however, that un-tagged Western Pacific gray whales are on a similar journey. Weller and Amanda Bradford last summer presented a paper showing that four Western Pacific gray whales, cataloged as part of a photo identification study, had turned up in Baja's renowned San Ignacio Lagoon. It might seem to some that, given this information, there may be only one gray whale population in the North Pacific, and it just so happens that some gray whales utilize Russian coastal waters during the summer. But Weller says there have been observations of gray whales off Japan and China in the winter and spring, and a photo-ID match showing a Honshu-Sakhalin link, suggesting that "not all gray whales identified off Sakhalin share a common wintering ground." Thus, a strong conservation efforts is still required in order to protect the small Western Pacific gray whale population. Varvara will be nearly impossible to discern from other southbound gray whales. It's not known if she will pass beyond or inside of the Channel Islands. If boaters spot a very small tag just in front of the first dorsal knuckle on a whale's back, however, they could be seeing Varvara. As of the time of this post, Bruce Mate, who runs the Marine Mammal Institute, could not be reached for comment. He may have been too busy trying to physically locate Varvara. Note: This research was conducted by A.N. Severtsov Institute of Ecology and Evolution of the Russian Academy of Sciences (IEE RAS) and Oregon State University Marine Mammal Institute in collaboration with the U.S. National Marine Fisheries Service, Kronotsky State Nature Biosphere Reserve and the Kamchatka Branch of the Pacific Institute of Geography. The research was contracted through the International Whaling Commission (IWC) and International Union for Conservation of Nature (IUCN) with funding from Exxon Neftegas Ltd. and Sakhalin Energy Investment Company Ltd.
OSLO - Norwegian authorities called Wednesday on the country's whaling industry to counter the dramatic drop over the past decade in the number of boats partaking in the annual whale hunts. The number of Norwegian vessels actively hunting whales has shrunk from 33 in 2001 to just 19 last year, Norway's Directorate of Fisheries said in a statement. "The authorities are therefore stressing the importance of the sector itself working to recruit new participants," it said. Whales have been protected by a global moratorium on hunting since 1986, but Norway does not abide by the ban. In a bid to sustain a small market, the government in Oslo has meanwhile gradually increased the annual whaling quotas in recent years. In 2011, it authorized hunters to cull 1,286 Minke whales, up from 549 of the small whales hunters were allowed to take a decade earlier. But with the number of whalers in free-fall the industry has increasingly had trouble filling its swelling quota. In the past couple of years, whalers have not been able to kill more than around half their quota, with just 41 percent of the permitted number taken in 2011. They blame overfilled processing plants, high fuel costs, hunting areas located too far from the coast and difficult weather conditions. Environmentalists meanwhile insist the whalers' failure to fill their quotas is the result of dwindling demand for the meat that was once a staple of the pauper's diet in Norway. Norway and Iceland are the only countries in the world to have lodged reservations against the 1986 international moratorium on commercial whaling, both claiming Minke whale stocks are large enough to merit limited hunts. Japan meanwhile uses a loophole that allows killing the animals for "lethal research," but a large portion of the meat also makes it to commercial markets. The encounters with blue whales off the Washington Coast earlier this month caused delight in the scientific community. But it also raised the question: Why are they here? It's unknown whether blue whales are expanding their range into this area, whether this was a one-off encounter, or if they are here every December but nobody sees them because it is so rarely possible to spend meaningful amounts of time looking for them in the wintertime in our stormy waters. The Corliss, a 56-foot fisheries enforcement vessel operated by the Washington Department of Fish and Wildlife, was out for the day from Westport, Wash., running zigzag transects as part of a collaborative study of whale distributions when six whales were seen about 30 miles west of Long Beach, Wash. Cascadia Research and Oregon Department of Fish and Wildlife are WDFW's partners in the NOAA-funded project. "I think the sightings are likely the result of a combination of factors that may include that there are favorable conditions that have created krill for them to feed on, that sightings are likely fairly rare, but perhaps not as rare as we thought due to the lack of winter effort offshore," said John Calambokidis, research biologist with Cascadia Research. The Guide Canyon, where the whales were found Dec. 8, acts as a sort of funnel that concentrates the upwelling of deep-sea nutrients, creating a delicious buffet of tiny shrimp-like krill. Washington state biologist Steve Jeffries noted that blue whales are still slowly recovering at a rate of about 2 or 3 percent a year after having been hunted to the verge of extinction. There are now an estimated 14,000 blues at most worldwide. 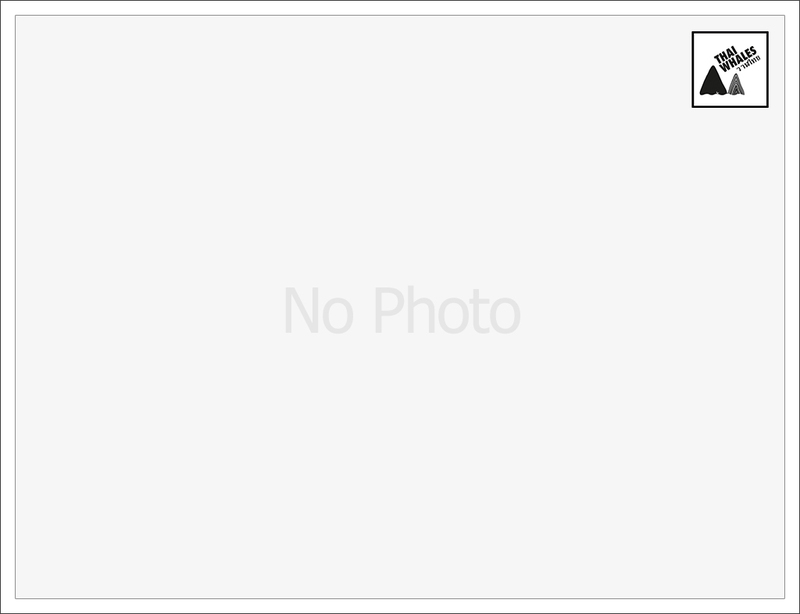 They are commonly sighted off California. Before industrial whaling started, estimates place their population at about 275,000. Blues are no longer hunted anywhere in the world. There were, however, whaling stations at Bay City in Grays Harbor (Wash.) County in the early 1900s and one in the Astoria area that operated into the mid-20th century. Calambokidis said of the Bay City station that, "while it primarily took humpback whales, it did take small numbers of blue whales although it did not operate in winter months." Cascadia has cataloged more than 2,000 on the West Coast based on photos of their mottling patterns and unique dorsal fin shapes. Four of the six spotted here have been previously photographed - one in 1987 off Monterrey Bay, Calif.; one most recently seen in 2009 in the Santa Barbara Channel in California; one seen several times in the Santa Barbara Channel, most recently in 2007, and once off Crescent City, Calif., in 2005; and one last seen off Crescent City in 2004. Researchers tried to place satellite tags on the whales seen here, but were unable to get close enough. Jeffries said the tags, smaller than a cigarette pack, are a minor intrusion on the whales but provide big payoffs in terms of information about the whales' locations. Crabbers and other fishermen rarely have any cause to venture far enough away from shore to have any chance of encountering the blue, fin or humpback whales. "There's nobody but us out there," Jeffries said. Even on a "nice" winter day, there is a 6- to 8-foot swell and perhaps a 20 to 30 mph wind. The blues are unlikely to be seen from shore here, Calambokidis said. "Sightings from shore occasionally occur in some areas including a few areas off California, but generally they are out closer to the shelf edge and well out of range of being seen from shore." Jeffries thinks it's possible observers might spot blue whale blows from high observation points like Cape Disappointment or North Head. Humpback whales are more likely to be seen close to shore in our area. Last summer, 30 to 40 "humpies" were seen together off Tillamook Head. This May, a breaching whale landed atop a sailboat that had to be escorted back into port by a 47-foot motor lifeboat from Station Cape Disappointment.